I have always had a soft spot for Pit Bu﻿ll﻿﻿s. They are very tenacious and obedient and have reputation for being really fun to train for competitions that may include but are not limited to obedience contests, weight pulling and agility related ones. They are also very affectionate with family and I have always loved the clingy ones. In fact, most Pit Bulls are really gentle and good with kids, as well. Although, that may be a hasty generalization. Moreover, Pit Bulls are very playful as well. With that being said, it is always very exciting and fun to reward them with toys that will really bring out the excitement in them. In this article, I give you 5 best chew toys for Pit Bulls. If you have a big sized Pit Bulls, then you should really consider this chew toy product. This is because this chew toy is mostly designed for really large dogs. First of all, Goughnuts is reputable as a line of durable and strong chew toys that are specifically made for those that chew aggressively. After all, it is designed by polymer. One of the things I like about this product is its shape. It is real perfect for chewing and for carrying around. Moreover, I also like that it can float on water so it is an ideal product if your dog loves playing around water. I also like that it has a safety feature that can alert you when it is time to replace it. Basically, the center of chew toy is made out of red rubber. Once the red rubber is exposed, it means it’s time to replace it. The Benebone chew toy is made out of nylon. To reiterate, nylon has a reputation for being a durable and strong material. This chew toy has been designed to last very long and to stand strong against aggressively chewing of dogs. Moreover, this chew toy is also available in many flavors. These flavors include chicken, bacon and peanuts. I do recommend that you supervise your dog from time to time. As a chew toy that is made of nylabone, this can work exceptionally well as an active toy. It can serve as a means to keep your moving and active. First of all, this chew toy is in the form of a bone shape so it can really trick your dog. Second, I really like that it is made out of nylon. Nylon is one of the materials that has a good reputation of being really durable and strong. This is a really helpful benefit if your dog chews very aggressively. Moreover, there are also ridges and grooves built in this chew bone. This certainly provides dental stimulation for your dog. In result, this ensures that the gums of your dog will stay healthy and strong. Furthermore, this also comes in a variety of flavors. This chew toy can mainly be used as a way to keep your dog really distracted. This chew toy does a very good job of capturing your dog’s attention. This chew toy can be described as really hollow and can be filled with your buddy’s most favorite treats. This toy can serve as a really fun challenge for your dogs. This shape also comes in an interesting three pronged one. This shape brings so many benefits. For one, it can allow your dog to grip it and chew on it. It also allows them to carry it and show it off. This chew toy is made out of rubber. The rubber is mixed with latex and non-toxic phthalate, as well. This Nylabone chew toy is a bit different than others in the list. 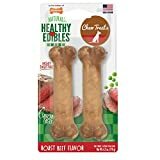 This chew dog bone is actually infused different vitamins and minerals that your dog can get when he or she chews on them. In fact, you do not ever have to worry about your dog swallowing them because they are actually edible. I love that this is available in many flavors such as bacon, roast beef and chicken among some more others. This treat bone does not contain any preservative or any sugar content, as well. Despite being edible, this was made to last long. When deciding on what chew toy to get for your very own individual Pit Bull, here are generally two topmost factors you must always take into consideration and keep in mind. Obviously, the most crucial factor out there is the material that the manufacturing company has used to make the chew toy. This is where majority will depend. Of course, you need something that is chew resistant. Obviously, there is no chew toy out there that can resist against chewing a hundred percent. However, some chew toy products are certainly more durable than other. As an example, they are made out of high quality and high strength rubber. Solid toys made out of rubber are usually the ones that are hard to ruin or destroy. Meanwhile, there are some actual toy products that can be destroyed in a couple of minutes because of the quality of materials used. As for the size of your toy material, it should always be proportional to your dog’s size. The general rule is, the larger the dog is, the larger the chew toy must also be. From the name itself, dogs play with chew toys by, well, chewing on them. As a result, there are chances that they can actually swallow it down. As common knowledge, when a dog swallows something as stuffy as a chew toy, it can lead to choking and blockage of numerous organs. This will eventually lead to organ failure and inevitably, to death. Now that we have talked about the different factors you must take into consideration and the things you should look for in a proper and good chew, let us now talk about the things you must avoid. First of all, you must try to avoid chew toys that have seams on them. Ignore my claim of durability and quality once you see those seams. So, why is this? This is because dogs, most especially when really determined and aggressive, will be able to tear the chew toy apart easily. Rope is also a common material used to make and produce toys. However, I personally find rope questionable when it comes to safety. This is because while ropes are very popular as a material used for toys, just like chew toys with seams, toys that are made out of ropes have fibers that can be chewed on when the dog is particularly aggressive or determined. Depending on the level of determination that your dog has, he or she can pull on this said fibers. Of course, this can lead to numerous digestive issues and problems. The fibers can ball up and get stuck in the intestinal tract of your dogs. However, do also take note that toys that are made out of ropes can actually help your dog when it comes to his or her dental health. You must also avoid toys such as tennis balls or balls that are made out of small foam rubber. And lastly, keep children’s toys out of reach. Examples are Barbie dolls. Overall, just keep in mind that supervising your dog is crucial so as to avoid any potential danger. When choosing on a chew toy, you must also consider and keep in mind the purpose of the chew toy you are going to get. Well, first, a chew toy can serve as an active toy for your Pit Bulls. Now, active toys are pretty much self-explanatory. Basically, what their purpose is to keep your Pit Bulls moving, and overall, active. As an active toy, they should employ certain characteristics. First, they should be easily tossed and thrown. This is to keep your dog moving as you will get him or her to chase the toy. Examples of this include but are not limited to ropes, nylabone, and balls. Of course, chew toys can also serve as more than just a means to keep your dog active. They can also serve as a distraction for your little buddies. Basically, what this does is captivate and capture the senses of your dogs. More often than not, it is often the kong type of toy that you can fill with treats. This can only be accessed by means of manual manipulation. This type of toy is able to distract them through the multiple rounds of tumble, chew and chase and then being rewarded with treats, afterwards. Lastly, we have comfort toys. From the name itself, toys can also serve as a means of comfort for your dogs. These toys are the ones that dogs like to carry around or the ones that come with squeakers in them. This inspires the dogs to mangle them so as to get rid of the noise. And the winner for the review roundup of best chew toy for Pit Bulls is Goughnuts Black Maxx Rubber Dog Ring. I chose this as my top pick for a number of reasons. First, I love the shape. Its shape is perfect for chewing and for carrying around. It will serve really well as a means to keep your dog active. It is also big in size and is therefore, an ideal chew toy even for larger sized dogs. Moreover, the line in which this product came from is reputable for a series of products that are made with polymer and made to last long and stand strong against aggressive chewing. Lastly, I like that it has a safety feature. The center of this product is made out of red rubber. Once hat color of rubber is exposed, you will know that it is time to replace it.